Jody Ahlm studies the relationship between sexualities and digital media in the U.S., paying particular attention to intersections of gender, race and sexual identity. 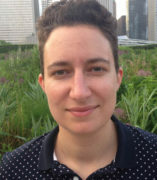 Her work lies at the convergence of sexualities studies and science and technology studies, contributing to fields such as critical heterosexuality studies, media studies, and LGBTQ studies. Jody received her PhD from the University of Illinois Chicago in 2018. Jody's recent work investigates the relationship between technological and social change, through a qualitative study of mobile hookup apps. These apps represent a significant touchstone in the ongoing poplar and academic debate about the effects of communication technology on social intimacy and social inequalities.